Before you start to read the attached article please understand it was originally published in mid 2011, four years ago. How much of this made the mainstream news? Now the question of relevance today immediately jumps into the mind of many. To this TLB asks … Do you honestly feel our health and regulatory agencies have found a conscience in the past four years? Are their morals and scruples today a shining example to the American people who depend on and trust in them to protect us? Or have they continued down the path of greed and complicity to heights unimaginable a scant four years ago? What you are about to read is not isolated or unique to the FDA and the precedence have long been established. This is the story of every agency we look to for our and our loved ones protection, weather it be related to drugs, vaccines, foods, or environmental toxins. Please don’t forget (unless this is a shocking revelation to you), these so called health and regulatory agencies are actually for profit corporations (FACT) just as their masters the Biotech, Chemical and Pharmaceutical companies. A sting nailed a company the HHS authorized to oversee human drug trials. The absurdities in the application are belly laugh funny, but in their rush to keep the money coming, they approved it. The FDA farms out drug and medical device testing. It’s in the hands of the companies hoping to gain approval for their products, but they must first get approval before doing tests on humans. Even here, though, there’s a catch. The FDA doesn’t review the testing plans. That’s done by more for-profit companies, Institutional Review Boards (IRBs). But it gets worse. The IRBs are paid by the companies hoping to gain FDA approval for their products. So, it’s a conflict of interest on top of a conflict of interest. Congress became suspicious, so they got together with the General Accountability Office (GAO) to set up a sting. They sent out an application for testing of a nonexistent product, Adhesiabloc, by a nonexistent company, Device Med-Systems. Subtlety is apparently not one of the GAO’s strong suits. Adhesiabloc was described as a gel that would be poured into a patient’s stomach after surgery to collect the bits and pieces left over from the operation. The instructions were to pour more than a liter into the wound. Not one of the IRBs bothered to check the credentials of Device Med-Systems. Not one noted that the company’s headquarters was listed as a post office box in a shopping mall. The doctor who was supposed to have been leading development, Jonathan Q. Kruger, didn’t exist either. Not one checked to see if the product had ever been registered in development. Even so, two of the IRBs turned them down. Apparently, they actually read the testing protocol. The board member of one stated that it was the “riskiest thing I’ve ever seen on this board,” and an employee of the other simply called it “junk”. Coast IRB LLC of Colorado Springs apparently didn’t see any value in reading the documentation. Their board members, several of whom were MDs, approved it unanimously, describing it as “probably very safe”. If that isn’t bad enough, the GAO did a second sting—and this one was on the Department of Health and Human Services (HHS), the parent of the FDA. The name of the fake company was Phake Medical Devices. The names of the principals were April Phuls,Timothy Witless, and Alan Ruse. The company’s location was listed as Chetesville, Arizona. We are doing our level best to ensure protection for subjects of clinical trials under our review, an objective we share with the Food and Drug Administration. We are legally and morally obliged to report any unlawful conduct we find occurring in a clinical trial and, so, fulfilled that responsibility in this case. Dueber went on the aggressive, saying that sting operations are illegal unless they’re approved by the courts. He went into high dudgeon, playing the poor innocent. He claimed that congressional investigators had “perpetrated an extensive fraud against my company.” Coast IRB further stated that they were “violating wire fraud, mail fraud, and state laws against fraud and false credentialling”. Ummm…Exactly what was Coast doing? Wasn’t that fraud? And on a much grander scale—one that can result in the deaths of huge numbers, like Vioxx, and Avastin, and Hormone Replacement Therapy, and so many others. The FDA never moved against Coast. However, the good news is that the company didn’t survive. Their business dried up. The saddest part of this tale is that none of this is news. This happened nearly two years ago. Nothing has been done to resolve an obviously corrupt system. The stings revealed an obvious and utter lack of concern for the quality, safety, and efficacy of drugs and medical products by the agencies tasked with overseeing them. Not a single step has been taken to safeguard the public. Not even lip service has been paid. In fact, the opposite has happened. Instead of pulling power away from HHS, the FDA, and companies they’ve authorized, they’ve been given even more power. And they’ve used that power recklessly against innocents and healthy products, such as raw milk producers and their customers, health food products and stores, and other healthy products, like walnuts. They’re doing this while allowing more and more truly dangerous and useless products to continue to be produced and sold by those who hold the real power over them: Big Pharma and Big Medicine. The FDA supports the profits of Big Pharma and Big Medicine over the rights and health of the people. HHS supports the profits of Big Pharma and Big Medicine over the rights and health of the people. Other than a little showboating, Congress supports the profits of Big Pharma and Big Medicine over the rights and health of the people. The FDA describes themselves as being in place to protect the American public. Most people these days know better, especially when reports like the following display to citizens the sort of malicious folly carried out on the daily by the agency. 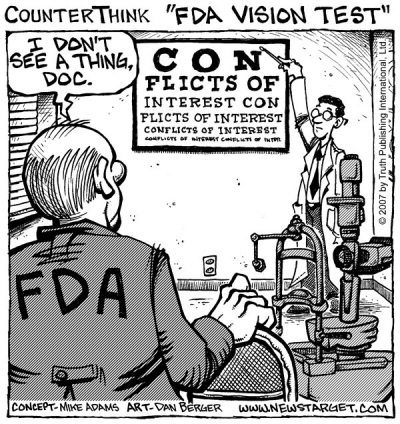 In stings set up by Congress with the General Accountability Office (GAO), the FDA displayed its lack of attention to obvious dangers and fraud by approving medical testing for a ridiculous device and approving a company with laughingly phony names as one of its Institutional Review Boards (IRBs) which are the for-profit companies that really do the testing of products. The medical device that was approved by one of these established IRBs of the FDA? Adhesiabloc was presented by a nonexistent company, Device Med-Systems, and described as a gel that would be poured into a patient’s stomach after surgery to collect the bits and pieces left over from the operation; the instructions were to pour more than a liter into the wound. Even though there was no record of the company and the doctor who was supposed to be leading development was fake, the item was approved to be tested on humans. Yikes, and now the FDA is poised to gain more money and power with legislation passed by the current administration. Where is the line drawn when it comes to gross neglect of duties? Why is the administration, instead of going through an intensive review process, allowed even more jurisdiction over the health of the American people when they have already been clearly neglecting their proposed responsibilities? TLB recommends you visit COTO Report for more pertinent articles and information.